If stores can start Christmas season six weeks early, then so can Hollywood. Yes, it's time for the annual "Wait, a Christmas movie already?" movie, and you know what – you complain, but you're gonna go see it anyway. Fred Claus is attempting to walk a strange and difficult line. As a Christmas-themed film hoping to be a blockbuster, it has to be family-friendly. Yet it's also banking on the star power of Vince Vaughn, who's best known for some, let's say, ribald roles, and who is not switching up his basic movie persona as a fast-talking alpha-jerk for this film (but then: the PG rating means there's probably no repeat of the opening scene of Wedding Crashers). Vaughn stars as the titular character, the lay-about brother of Santa (played with great casting by Paul Giamatti), who's never quite lived up to the golden boy of the family. After a run-in with the law that costs him his job and his girlfriend, he heads back home to the North Pole where sibling rivalry heats up once again, and Fred wrecks havoc in the Workshop in PG-rated fashion. They're trying to grab a couple of very disparate demographics with this film in families and the 20/30-something adults, and it'll be interesting to see just how well they can do it. Elf is the obvious comparison for this film, with Will Ferrell cashing in on his comedy chops for a family comedy, to great success. It's seemingly impossible to fail with a family comedy lately, at least if you give it one recognizable star. See also the recent The Game Plan for a film doing much better than it had any reason to. 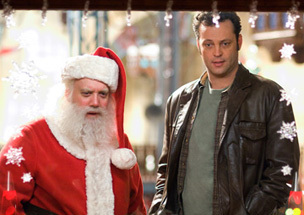 Fred Claus doesn't look great, but it should be able to at least do well for this weekend, with around $32 million.